Because it came in the wake of the Yankees’ blockbuster trade for Michael Pineda, the acquisition of Hiroki Kuroda has been somewhat overlooked. Even now, the Japanese right hander seems to be getting short shrift on his own team. Recently, Yankees’ pitching coach Larry Rothschild identified Pineda and Ivan Nova as candidates for the number two slot in the rotation. However, if A.J. Burnett is traded and Freddy Garcia is sent to the bullpen, Kuroda will rank behind only CC Sabathia in terms of experience and success as a starter (Kuroda’s 114 games started are almost as many as Pineda, Nova, and Phil Hughes combined). What’s more, over the last two seasons, Kuroda has ranked 36th and 44th in bWAR and fWAR, respectively, which suggests the righty is a solid number two. So, why does it seem as if not too many people look upon him as being one? Although the Yankees acquisition of Kuroda has received some appreciation, there has also been hesitation expressed about his migration from the N.L. West to the more talent laden A.L. East. In addition, there have been concerns over the move from pitcher friendly Dodger Stadium to Yankee Stadium and its short right field porch, a fear heightened by the spike in Kuroda’s HR rate last season. However, during his Dodgers’ career, Kuroda hasn’t been a product of Chavez Ravine. Rather, he has pitched just as well on the road as home (3.43 ERA with .661 OPS against vs. 3.48 and .687). Also, an overlay of Kuroda’s batted balls at Dodger Stadium transferred to Yankee Stadium reveals only two additional HRs (doubles in Los Angeles that would have cleared the left field wall, not the short porch, in the Bronx), which hardly suggests a potential long ball epidemic. There are obvious drawbacks to an overlay, including variables like atmospheric conditions and ballpark-impacted pitch selection (not to mention the accuracy of the simulator). Also, the general trends in Kuroda’s batted ball data suggest an increase in both line drives and fly balls, which doesn’t bode well for his ability to keep opposing hitters in the park. Over his first three seasons, the right hander was able to induce ground balls more than half the time, but in 2011, that rate dropped all the way to 43%. Perhaps more concerning was the precipitous rise in line drives, which seems to justify the spike in Kuroda’s HR rate. 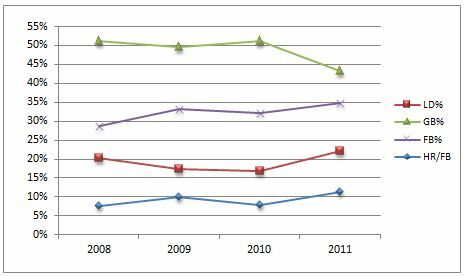 Does Kuroda’s move toward being more of a fly ball pitcher represent the start of new trend? It’s hard to tell from one year’s worth of data, but a closer look at the home runs he allowed in 2011 might suggest the increase was more of a fluke. Exactly half of the 24 homers allowed by Kuroda came with two strikes, which was more than double the five he allowed in the two seasons prior. In fact, Kuroda’s struggles with two strikes weren’t confined to the long ball. 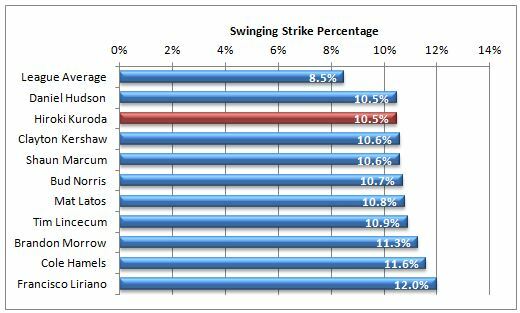 With the exception of 0-2 counts, opposing batters hit well above average against the veteran pitcher in every other two strike combination (click here for a look at how hitters performed with two strikes in 2011). If Kuroda is able to cut down on the damage against him with two strikes, not only might his HR rate return to more normal levels, but his performance could improve across the board. It’s hard to predict whether or not he will be able to make the adjustment, but perhaps pitching against stiffer competition in a more hitter friendly environment will improve his concentration (i.e., pitch selection) with two strikes on the batter? That’s all conjecture, but regardless, Kuroda has substantial room for improvement in two strike counts. Note: sOPS+ measures Kuroda’s performance against the league average in a particular split. For example, his sOPS+ of 121 in all two strike counts indicates opposing batters hit 21% better against him. Another concern expressed about Kuroda’s transition to the Yankees is the impact of the team’s porous infield defense. 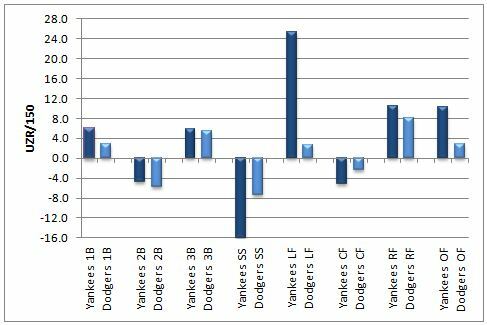 However, according to UZR/150 (which, admittedly, is far from an exact barometer), Yankees’ infielders were at least on par with the Dodgers’ at every position but short stop. Also, based on advanced analyses like Mike Fast’s recent study on catcher framing, Russell Martin ranks as one of the best defensive backstops in the game (according to Fast’s framing data, Kuroda’s catcher in 2011, Rod Barajas, ranked toward the bottom in 2011). Finally, as a group, the Yankees’ outfield led the majors with a UZR/150 of 10.2, which was well above the Dodgers’ rate of 2.8. So, even if Kuroda has gradually become more of a fly ball pitcher, that could play to his advantage on the Yankees, especially if he can get opposing batters to hit the ball to Brett Gardner. Defense is always an important part of the equation when evaluating pitching, but in Kuroda’s case, it might be a little overrated. Because of his age, and perhaps the perception that he is a control specialist, many people seem to regard Kuroda as a contact pitcher. However, over the last two years, he has proven to be adept at missing bats. Among all qualified pitchers spanning the last two seasons, Kuroda ranks ninth with a swinging strike rate of 10.5%, or two percentage points higher than the league average. If Kuroda can continue to fool hitters, especially during the period when they are learning his patterns, his ability to generate swings and misses could mitigate some of his defense’s shortcomings, if they do exist. There are usually many unanswered questions when a player transitions to a new team and league, so skepticism surrounding Kuroda’s ability to maintain his success in the Bronx is only natural. However, based on his track record and the Yankees’ short-term commitment, there’s every reason to be optimistic that the right hander will be a positive contributor in 2012. Will he be the number two? Such distinctions really have little relevance in the grand scheme of a 162-game season, but if the sentiments expressed by those who know him best are accurate, I wouldn’t bet against it. It's interesting because he faces so many challenges--being older, staying healthy, changing leagues. He seems up against it. But he's also got a track record of success in the face of the odds. Great analysis, William. Really helps look at things in a clear way. When he was free agent, I wasn't thrilled about Kuroda for all the skepticism cited above, but after learning more about him from your piece and looking at the numbers more closely, I expect him to be an above average starter. Kuroda has good stuff and knows how to pitch, so, if nothing else, he should be able to provide consistency and stability. I had a similar change of opinion - from low expectations to medium expectations. I wonder how much of it has to do with the many. many times we've been burned by NL pitchers since 2004? Off the top of my head, Vazquez I, Brown, Johnson, Pavano, Wright and Vazquez II saw their ERAs swell by about 2 runs when they came here. this was a good follow-up to alex's piece. as i sort of said yesterday, i still have kind of low expectations, but there are some harbingers for optimism, and i do agree that because he knows how to pitch that should help. just not walking people will be an improvement on the ajs of the world. javy still gets to me. i still think if he were not injured and then handled poorly with dead arm he would have done better in his two stints. on kuroda: belth + juliano = WIN!!! Yes, but it hasn't all been bad. Lieber didn't experience too much of a drop off in his brief sojurn in NYC. He did have a year off, though, in between. CC spent a bit of time in the NL immediately before donning the pinstripes. Our boy Obi-Shawn Chacon did pretty good after getting here from Colorado, though that was something of a fluke year for him. And of course, Mssrs. Pettitte and Clemens, upon their returns in 2007, did spend the prior 3 years pitching in the NL. I think Kuroda will be fine. He kind of reminds me of Pettitte - maybe not the greatest numbers in the world, but he does just fine. Whatever my doubts, he simply must be better than AJ or *shudder* Sergio Mitre. Thanks, but it should be noted that belth + spider monkey with leaky pen = win.